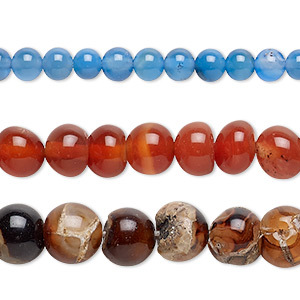 Bead mix, multi-agate (natural / dyed / heated), 4-12mm round, C grade, Mohs hardness 6-1/2 to 7. Sold per (5) 15" to 16" strands. Item Number: H20-9087KL Have a question about this item? 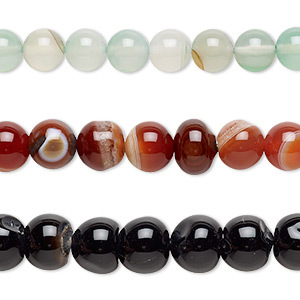 Materials can include red agate, black agate, moss agate and more. 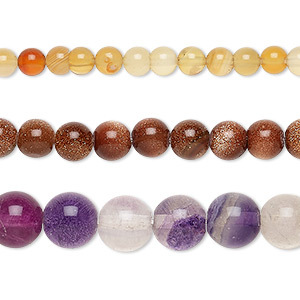 Bead mix, multi-gemstone (natural / dyed / heated / imitation) and glass, multicolored, 4-6mm round, D grade. Sold per (10) 15" to 16" strands. 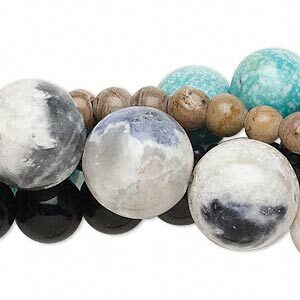 Bead mix, multi-gemstone (natural / manmade / dyed) and glass, 3-16mm round. Sold per (5) 15" to 16" strands. 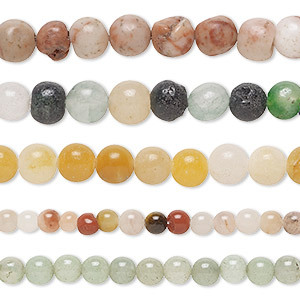 Bead mix, multi-agate (dyed / heated), mixed colors, 10-14mm round, Mohs hardness 6-1/2 to 7. Sold per pkg of (3) 13-inch strands. 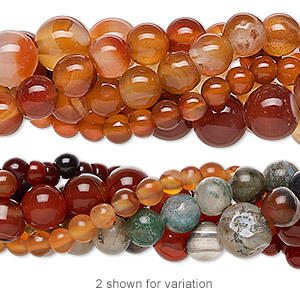 Bead mix, multi-agate (dyed / heated), mixed colors, 4-9mm round, Mohs hardness 6-1/2 to 7. Sold per pkg of (3) 13-inch strands. 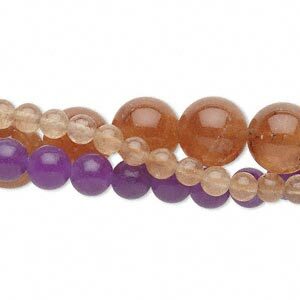 Bead, multi-gemstone (natural / dyed / manmade), 4-8mm round, C grade. Sold per pkg of (10) 15" to 16" strands. Bead mix, Malaysia "jade" (quartz) (dyed), 3-12mm round, C grade, Mohs hardness 7. Sold per pkg of (3) 15" to 16" strands. 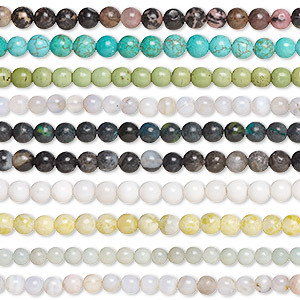 Bead mix, multi-gemstone (natural / dyed / stabilized / heated / manmade / imitation) and glass, mixed colors, 4-9mm round, Mohs hardness 3 to 7. Sold per (3) 15" to 16" strands. 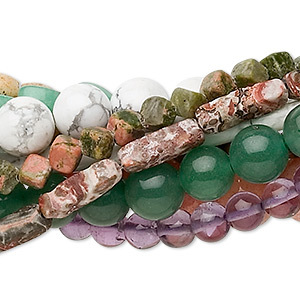 Bead mix, multi-gemstone (natural / dyed / heated), mixed colors, 4x4mm-20x17mm mixed shape, C- grade. Sold per pkg of (10) 15" to 16" strands. 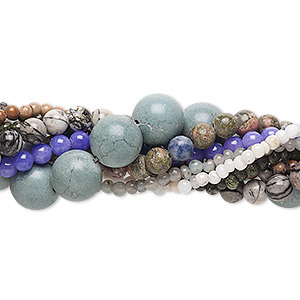 Bead mix, multi-gemstone (natural / dyed) and glass, multicolored, 4-6mm round, D grade. Sold per five 15" to 16" strands. 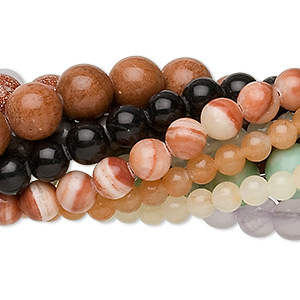 Bead mix, multi-gemstone (natural / dyed / manmade) and glass, mixed colors, 4-14mm round, C grade. Sold per (10) 15" to 16" strands.